Sheraton Hotels & Resorts has announced the global roll-out of its signature wine program to 430 hotels around the world. From Asia to Europe to the Americas, Sheraton Hotels & Resorts was raising a glass and betting big on its premium wine program with a global celebration. Sheraton Social Hour was hosting a 24-hour “Toast Around the World” at Sheraton hotels and resorts across the globe including Edinburgh, Mexico City, Bali and Bangalore. The festivities kicked off in Asia with celebrations at the Sheraton Hong Kong Hotel & Towers and Sheraton Shanghai Pudong Hotel this month. A celebratory toast passed virtually, including Sheraton Bali Kuta Resort, Royal Orchid Sheraton Hotel & Towers, Bangkok; Sheraton Bangalore Hotel at Brigade Gateway around the world until it reached The Sheraton New York Times Square and The Sheraton Waikiki for the conclusion of the day-long global celebration. Hotel guests and brand followers were invited to join in on the virtual celebration with the brand’s new dedicated Social Hour mobile platform, Sheraton.com/socialhour, where they could browse through hundreds of toasts shared around the world for the special occasion or create their own using #SheratonToast. Want to raise a glass? Consumers and guests were invited to join the conversation and celebration at #SheratonToast. The Social Hour program, developed by today’s premier wine experts and the brand’s global food and beverage team, offers guests a specially curated menu of premium wines and weekly tasting events. 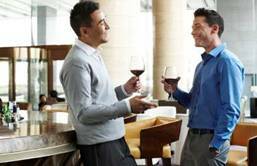 Sheraton Hong Kong will host evening Social Hour tasting events three times a week featuring three pours of 50ml of premium wines from the “Wines of the World” menu at HK$105 (service charge applies) – available at Lobby Lounge on every Monday, Wednesday and Friday at 6:00 – 8:00pm. Each glass is served in Stolzle stemware to ensure that each varietal is presented in the perfect stemware that artfully enhances the wine’s flavour and aroma. Notions of popcorn, toast, spiced apple, melon, and jasmine lead to a medium-bodied, ripe plush Chardonnay with savory flavors, lively acidity, and excellent length. Pale straw with lime green hues. Punchy lifted aromatics of lemon blossom, blackcurrant and papaya with subtle hints of fresh thyme and cordite. Medium to full flavoured with a fine texture. Limes, apples, lychee and honeydew melon characterise the fruit flavours which are framed by juicy acidity, providing great length of flavour. Fleshy in texture, full bodied, and intensely flavored (black currant, blueberry, dark plum, toast, dark chocolate, spicy oak, vanilla), well balanced, and very long on the finish. Notes of cherries, plums, licorice, dark chocolate, cassis and lingering smoked black-tar on the finish. Already some complexity beginning to develop out of its firm, quiet and supple core. Medium bodied. Lovely fresh flavours of plum and blackcurrants balanced with a gentle touch of toasted oak and subtle soft tannins.